Home UX/UI Design User Off-boarding: an FT case-study. 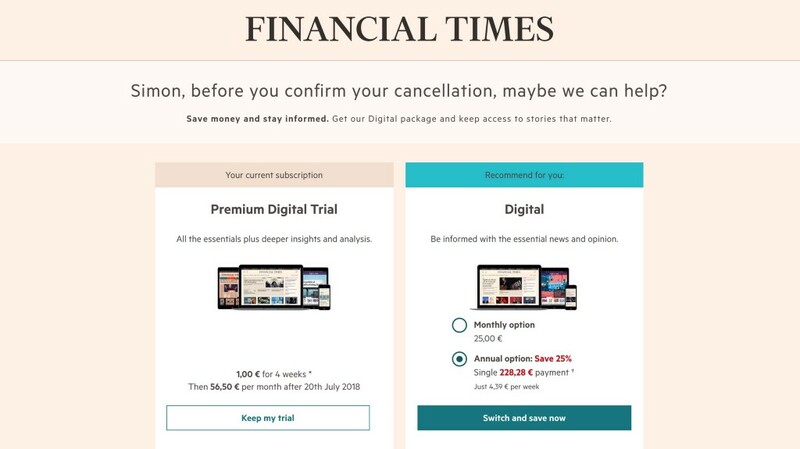 I recently signed up for a 4-week trial with The Financial Times; when I say recently, I mean I signed up for it precisely 27 days ago. The trial was spurred on by an appreciation for the FT’s grounded commentary and concise reporting, a welcome respite when so many are swinging to irrational political poles. It was also nudged by a comment in an old Marc Andreessen essay. I enjoyed reading the FT. In particular, the FTWeekend, Daily Digest and Opinion pieces are excellent. The customisation of following topics and writers is far more seamless than for most other mainstream media properties. Ultimately however, the trial was unsuccessful in converting me to a paying customer. Primarily due to budget — both financial and attentional. And so I entered the Cancellation Flow. A well-designed cancellation flow should reduce customer churn without re-capturing an embittered hostage. It should provide a well-lit path to leaving, a smooth exit ramp. But that does not mean it needs to be a definitive slap on the arse and good luck to ya. There are legitimate reasons why the user may wish to change their mind at the last moment and abandon their cancellation; user off-boarding should ensure that these reasons are apparent. Offer compelling alternatives to cancellation. Remind users what they’ll be missing. 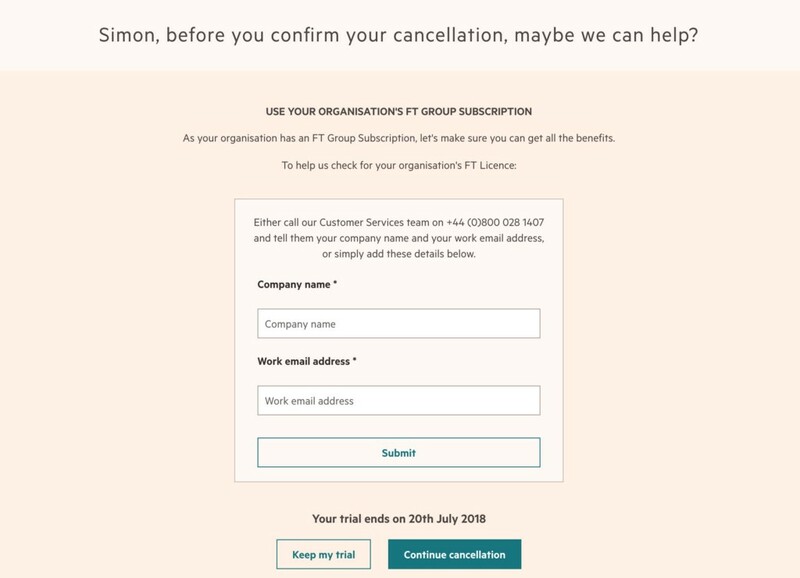 This FT.com cancellation flow was positioned at the end of a trial, rather than after a period as a paying customer, so there are some variations on the usual themes. The design task could be framed as an Activation-Retention blend. But for the most part, standard rules apply. The FT strikes a reasonable balance between simply waving goodbye and confusing the user into staying. This is not a Ryanair user-flow circa 2014. Although the exit ramp can only be found on desktop; there, the exit ramp is clear. It takes three clicks to leave — there’s a fair bit of text planted in your way, but it’s clearly delineated and the “continue cancellation” button is well-marked on each page, albeit below the fold. Depending on how militant your stance on these things, I don’t believe that the forces of dark UI patterns are at play — especially considering that I’ve just been treated to 4 weeks of free premium content. The questionnaire is a good starting point for the cancellation flow. It is enforced and allows the FT to learn why it is that I am cancelling. In doing so, they can better tailor their argument for asking me to stick around. The questions are obviously for trial users and include many of the reasons you would expect that users signed up in the first place — “I only wanted to read one article”, “I just wanted the four-week trial, not a full subscription”. Neatly separating potential customers from the window shoppers. The answer given to the questionnaire determines the next step in the user flow. It is tailored to the questionnaire response, but it is far from personalised. Notably, two of the windows lead to the offer pictured; not exactly an offer I can’t refuse. To boot, the offer is not altogether straight-forward. Does “keep my trial” mean extend it by another 4 weeks, as I initially assumed? It doesn’t. And what is this Digital offer? In reality, the options offered are ‘Do nothing and pay €56 tomorrow’ or ‘Here’s a cheaper option’. However, that’s not obvious without deliberate consideration. In a parallel flow, if I declare my cancellation reason as my status as an impoverished student, I am offered something more appropriate. 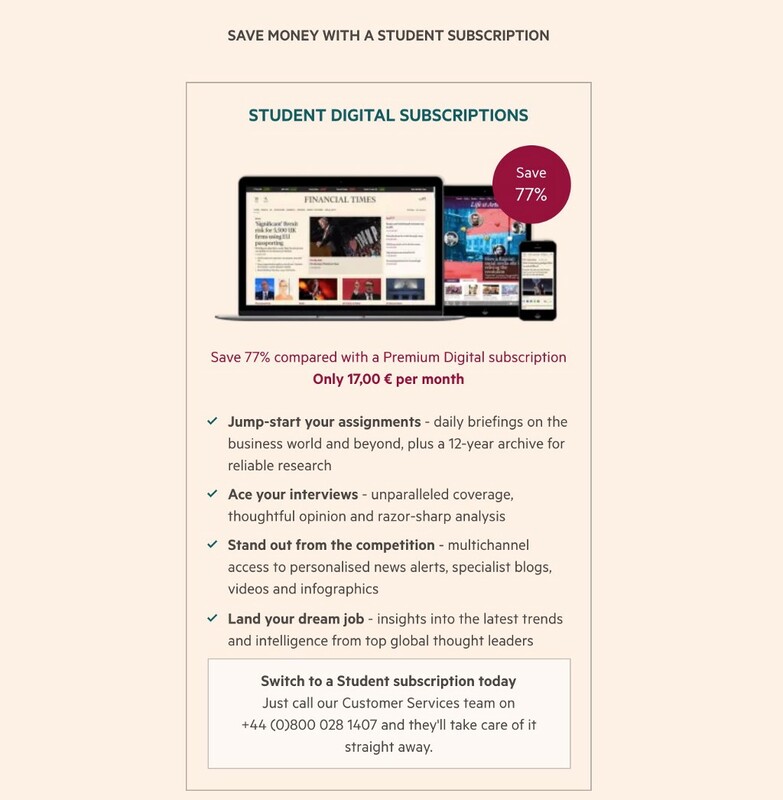 There is a compelling alternative to the €56 monthly Premium subscription at a more manageable €17, with relevant benefits that I can expect to gain from FT.com access. In another parallel flow, if I declare that my company already has a subscription I can merge my account — retaining my data and preferences, presumably. This is great; a nice touch. Acknowledging that I have invested time in curating my feed I get to keep it. Convenience — merge and continue. Remind users what they’re missing. There are several ways that companies can play the “you’ll miss us when we’re gone” card. Remind of key features, remind of key benefits, remind of aspirational lifestyles of those with the product. Bringing the powers of FOMO to bear on the user, in varying degrees of intensity. There’s also working on the user’s loss aversion. Notably, if you’ve put effort into customisation and community building, it’ll be hard to walk away. The FT does not play either of these cards. Once I pulled the plug, the parting message was nice. I can go on accessing Premium content until the end of the trial. I will still be able to access select features (Videos, Podcasts, some email updates). No hard feelings — a nice touch, a warm hug goodbye. Overall, the cancellation flow is decent. It is moderately easy to find, quite easy to navigate, is somewhat tailored to user feedback, and leaves the user with a positive last impression. However, the flow undersells the FT experience. There are latent opportunities for the FT team to convince users to stay. These are not arguments that I believe would have turned my head, and perhaps the FT team have experienced my user segment as being unlikely to convert, and thus not worth the effort. Or perhaps there is an element of counter-signalling at play — actively discouraging users who are not already committed to the notion of being an FT subscriber. But I don’t buy it; literally. Make it aspirational. There is little selling on lifestyle, on personality. Each of the offers centre on features, not user benefits. Perhaps the readership are in fact ideal realisations of homo economicus — perfectly rational actors in a world with no place for behavioural economists. Now, I love a rational argument as much as the next Bayesian — but I don’t expect to see it in a sales funnel; nor do I resent being sold on a lifestyle. I would love to see the FT spell out what I’m missing out on; how my worldview would be improved with an FT subscription. Make it personal. In many ways, this is really a missed opportunity in personalisation and habit-forming during the trial period. While the customisation features are well-delivered, I was unaware of much personalisation going on (admittedly, this could be a sign of very good personalisation toiling away behind the curtain). In particular, there is an opportunity here to show me how others are using the FT to their advantage — and how I can be like them. To help me form regular FT-centred habits. 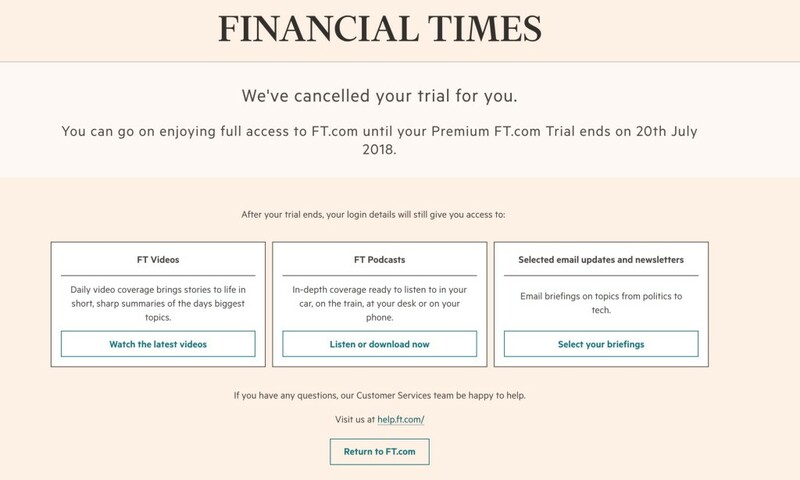 While I enjoyed the FT experience, it did not become a necessity. I know plenty of people for whom it is a necessity — sure, many of those in finance — but I do feel there was a way to bring me over to their side. Despite regularly dipping in and out, I did get the feeling that I could (and should) be getting more out of the content. 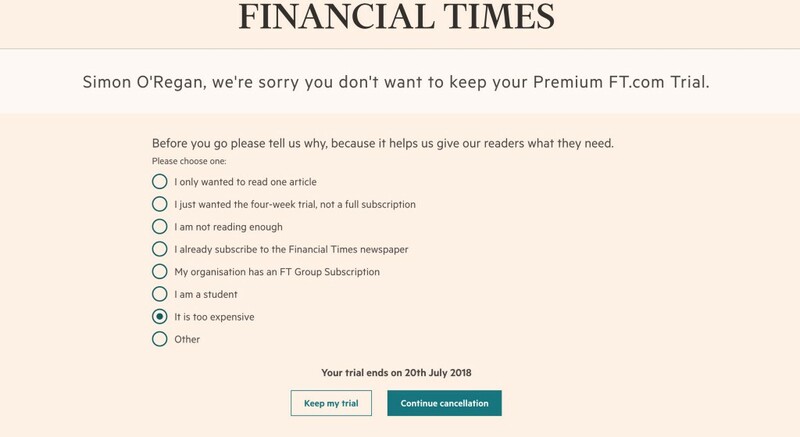 I would love the FT to show their users how. Finally, I wonder is it possible to pre-empt cancellations a little before the trial ends — either by asking directly or doing a little bit of predictive analytics and then tailoring the response. But that’s a thought-experiment for another evening. User Off-boarding: an FT case-study. was originally published in UX Collective on Medium, where people are continuing the conversation by highlighting and responding to this story.